Mega Jump [iTunes Link] is a hugely popular game for iPhone developed by Get Set Games which uses the accelerometer in the device to control a cute monster-like creature. The monster jumps up, and then is propelled continuously upward by collecting coins. It’s your job to move the little guy towards these coins by tilting your device from left to right. In addition to coins, there are also a number of other objects in the sky you can hit with your character to assist you in your quest upwards. 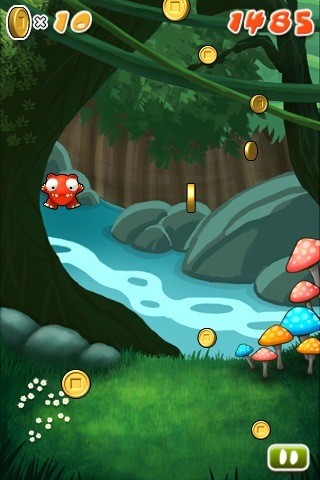 For instance, hitting a magnet will attract all the coins to you, taking you skyward even faster. There is also a balloon that will inflate the monster and help him float toward victory, as well as a fireball that will propel him forward at rocket ship-like speed. I’ve been playing this game for a few days now, but have found the whole experience a little awkward. You’re trying to get the monster to go up, but you’re only tilting the iPhone left or right in order to do so. The controls are also not as sensitive (or maybe a little too much so) as they really should be for this type of game, so I end up sending my monster off the side of the screen all the time. Due to my considerable lack of monster control, I have also not managed to make it past even the first stage of the game after several hours of play. All that said, the game is only $1, and will keep you (obviously) playing for hours. Gameplay is fairly addictive, and there are several height and point goals you can attempt to achieve along the way. The coin placement also appears to be random to some extent, so if you mess up and start playing a new game the board will look a little different every time, which certainly helps to spice things up.